The Crown's Order of Gratitude (C.O.G.) may be bestowed for service to the Sovereign and Consort of Trimaris. 2.) It is known that We the Crown Trimaris do depend upon those around us who give selflessly of their time and service in Our behalf. Therefore on this ____ day of _____, A.S._______ We welcome ________ as a Companionof the Crown’s Order of Gratitude. 3.) We the Crown Trimaris could not serve Our subjects half so well were We not served by selfless devotion and assistance. It is right that We should make these services known, as so well exemplified by ____________________, whom this day we designate a Companion of the Crown’s Order of Gratitude. Given upon the ____ day of _____, A.S._______. 4.) Upon these shores are those whose devoted assistance to Us makes the Dream come alive, for without them We would be diminished. This service will not go without recompense, for We the Crown Trimaris call forth______________ to take a place as a Companion of the Crown’s Order of Gratitude. Thus made by Our seal upon the __________ day of _____, A.S._______. 5.) As King and Queen of Trimaris, We have many duties which would be impossible were it not for those around us who give tirelessly of their time and effort on Our behalf. We, the Crown Trimaris, are therefore pleased toname ________ , from this day forward, as a Companion of the Crown's Order of Gratitude. To this We set Our hand and seal on this _____ day of _____ , Anno Societatis _____. 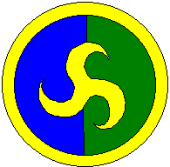 per pale azure and vert, a triskele within a bordure or.